Venerable Bhikkhuni Dhammananda, formerly known as Dr. Chatsumam Kabilsingh, was bom in 1944. 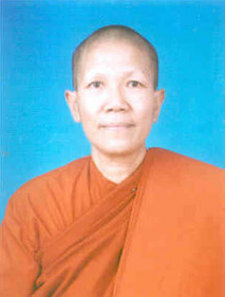 She received her education in India and in Canada , and became the first Thai woman to receive a doctorate in Buddhism. She spent 30 years teaching Philosophy and Buddhism. First she taught in Canada and later at Thammasat University in Bangkok . While at Thammasat University she was an Associate Professor and President of the Women and Youth Studies Program. She was also the Chair of the India Studies Center . As an academic she has written more than 50 books. She pioneered research and writing on Women & Buddhism. She has been active at the international level both as a Buddhist and as a female scholar. She co-founded Sakyadhita, an International Buddhist Women's Association, and was its President from 1991-1995. For the past 20 years she has published Yasodhara, a newsletter on Buddhist Women's activities. She was an associate at the Royal Institute for nearly two decades, a seat which she gave up after her ordination. She is now a Peace Counselor to an international Peace organization in the USA , and also a vice-chair to a committee to select awardees for the Niwano Peace Award in Japan . Venerable Dhammananda gave up worldly interests and courageously chose to follow in her mother's footsteps to become a female monastic, a path not much known in Thailand . With her strong academic background, she is totally committed to reclaiming the Bhikkhuni lineage, a heritage given by the Buddha. The responsibility which she shoulders is to educate the Buddhist community in order to have a better understanding of Buddhism. She regularly offers training courses to both local and international groups. During the rains retreat she organizes a training program for international Bhikkhunis and laywomen. She writes regularly, accepts invitations to give Dhamma talks, and her teachings are accessible to the public.